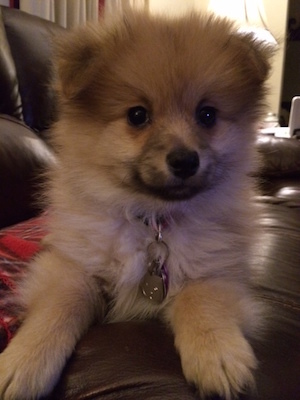 If you review any of my books, you can add your dog’s photo and description to the gallery. Just drop me a line with a link to your review, a photo, and a paragraph about your dog. 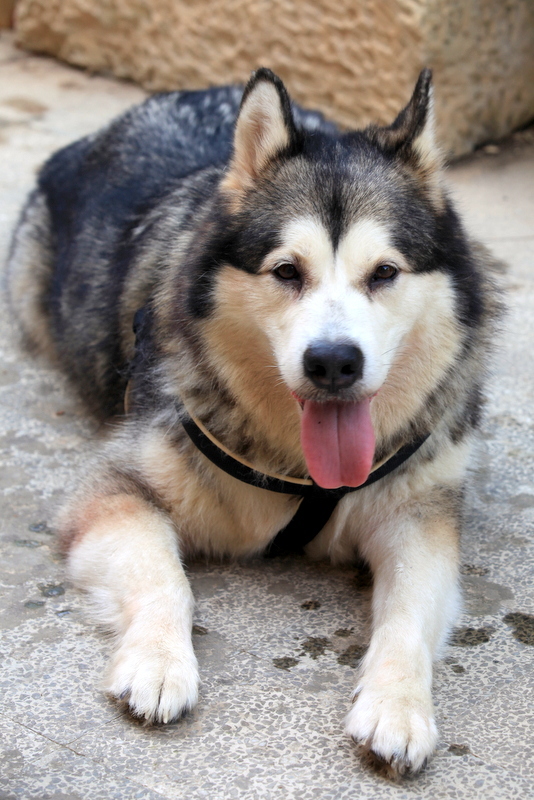 Kaia is an Alaskan malamute I had the good fortune to adopt when she was 6 years old. She has been the joy in my life ever since but she is now ageing fast and I know I am going to be devastated when she passes. She is 11 years old this year. 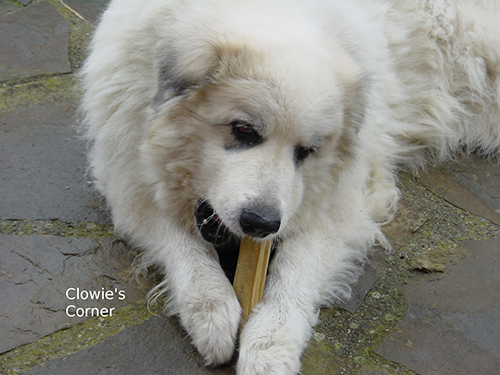 We have a Great Pyrenees named Willow. She is 3 years old. We’ve never had such a smart dog, and such a bad one too! My theory is that when she gets bored, she gets destructive. She is still in a kennel when we leave the house because of that. She doesn’t recognize the word bad either. She is a very loving girl, but has never given kisses. 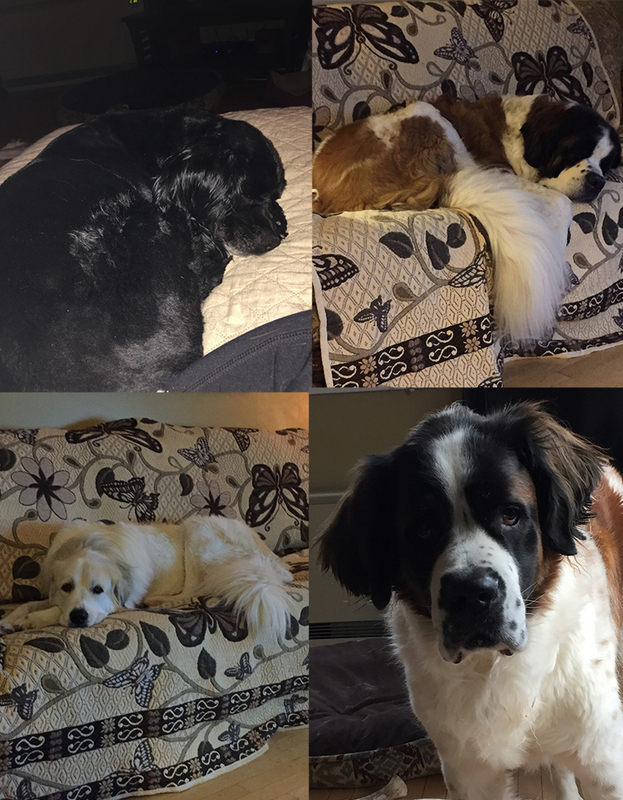 We also have two Saint Bernards named Max and Heidi. They are 5 and 6 years old, and brother and sister. Finally, our oldest is Blossom, an 8 year old black cocker spaniel. 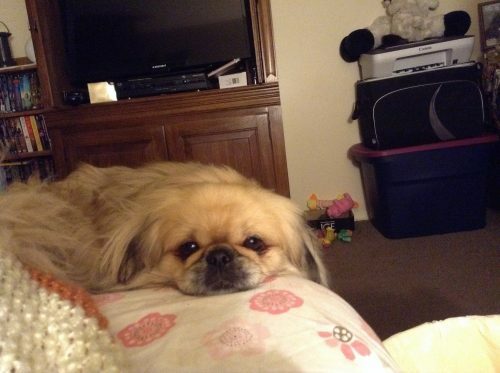 MoMo the Pekingese is a little character. He loves people (kids not so much though he will put up with them for an hour or two). He’s my “little man” and I would be lost without him as he saved my sanity more than once. He loves to scold me when I return from somewhere. His scoldings are delivered in a voice that is a cross between a snort, a bark, and a growl. To make matters worse, he has to always have the last word. LoL. My little Toby, now 11, goes to The Waggery (Doggy Day Care) once or sometimes twice a week for socialisation with other dogs and he loves it. Staff refer to the dogs as “the kids”, and are so caring. Here he is with some of his “fur kids” friends, and in the other one he’s exhausted after a day at doggie day care. People sometimes remark “Oh Cheryl, he’s only a dog” when I’m concerned about him, but he’s my little mate. He gets a little put out when my daughter visits as he’s not the centre of attention. 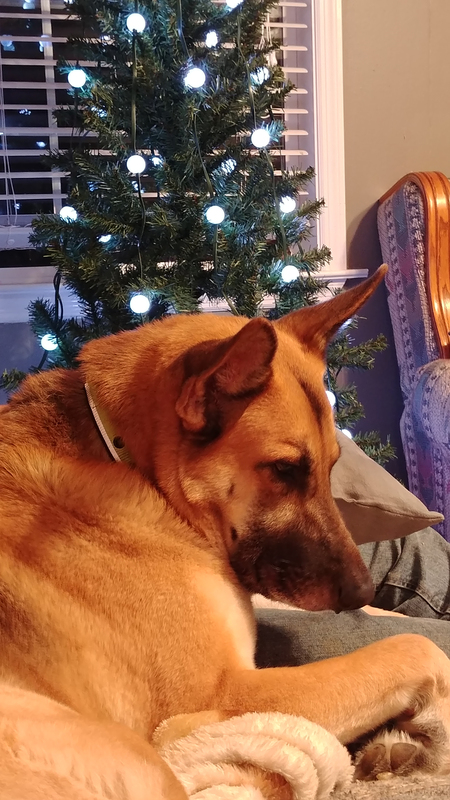 Ranger is a 6 year old German Shepherd Dog. I received him as a gift when he was four months old and I must say one of the most treasured and life changing gifts ever received. This boy is my companion, my protector, my canine kid, as well as his mate and two of their offspring I kept. My dogs fill my life with comfort and happiness and most of all…UNCONDITIONAL LOVE. I just hope that I am someone they look up to, as when I see them look at me, I feel that I am. This is Blaze, a Staffordshire Bull Terrier. 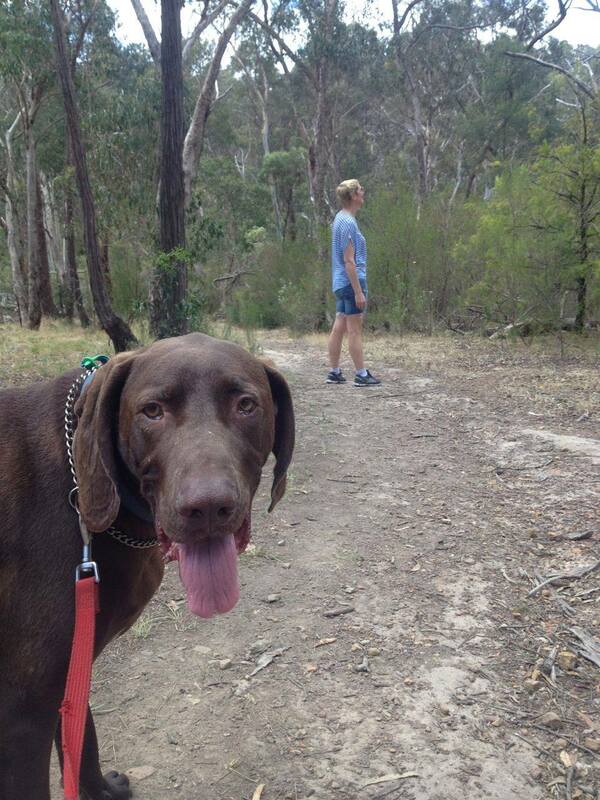 We’ve had him from a puppy, and he used to go everywhere at a run. He’s twelve now, a bit grey round the muzzle and he’s slowed down a bit – not unlike his owner! He still enjoys a good walk, though, especially if we go to the seaside and he can sniff around on the beach. 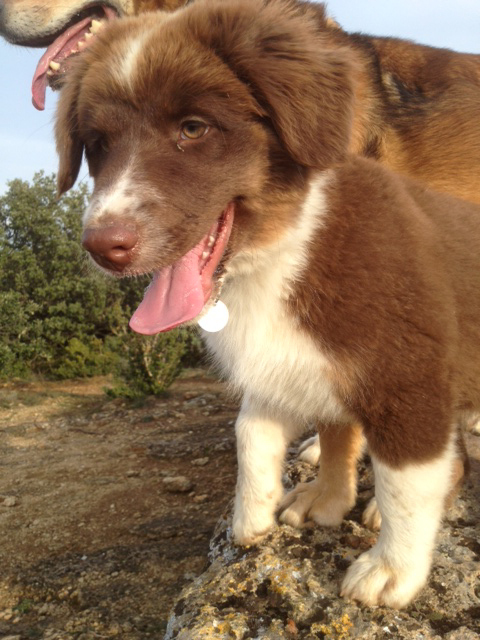 Jolene is an Australian Shepherd and major screwball. When not pestering the love of her life, Rufus (the other Mebane dog), she can be found waiting cheerfully for her next walk. Here is a picture of Gustav – we just adopted him about a week ago. He is about 20 months old and is little skinny for a Great Pyrenees, but such a good boy! I can’t imagine anyone giving him away. We are so happy to have him! 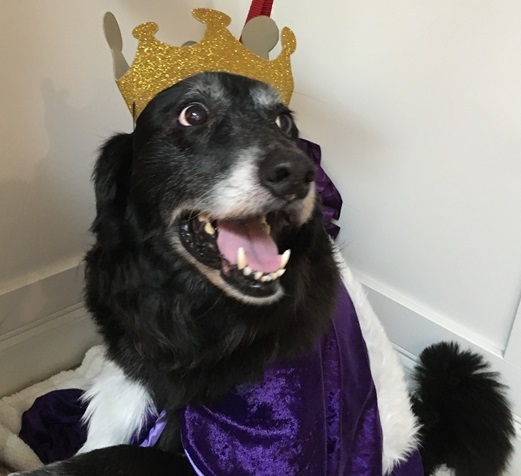 I am Barney, a 13 year old Black Lab/Greyhound mix. I found my present owners at the tender age of 9 months when they came to the shelter looking for a furry friend. 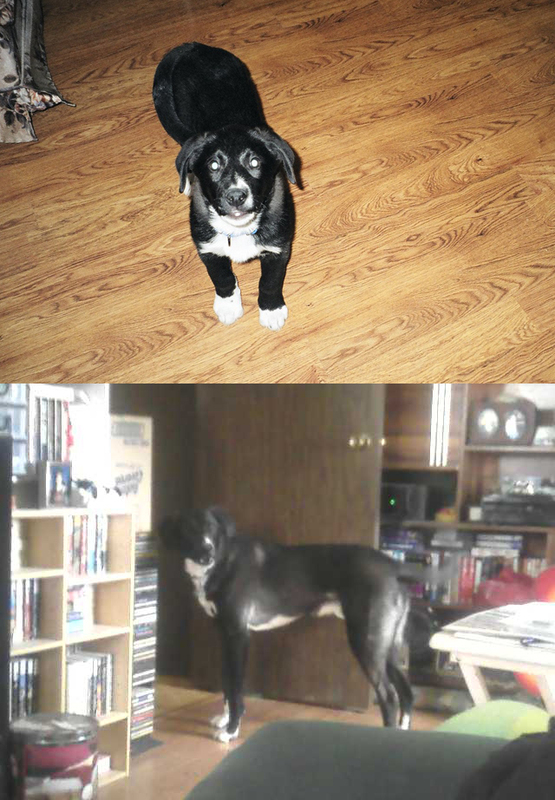 I have attached two photos of me – one at 9 months of age and one of me now at 13 years old. Frankie is a ball playing fanatic who likes everyone he meets. He keeps an extremely neat kennel, is neutered, gets along with kids and cats and loves to swim! He’s about 5 years old and came to the shelter when his person went into hospice. Chaussette est une chienne de 20 mois de race berger australien, qui fait notre bonheur chaque jour. 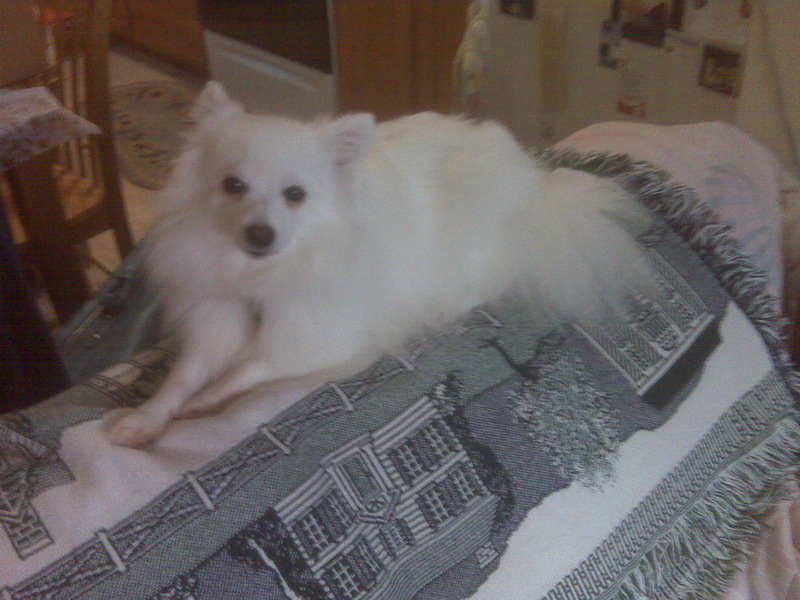 I got my Japanese Spitz, Haley when she was two. Now she is ten and we have been through a lot together, including a divorce. Unlike your book, I kept the dog and she is still with me in her forever home. She has a sweet nature, but does get into mischief. Her favorite naughty act is to get into the trash or wastebaskets. I still love her, despite this. She is a joy and loves to go on walks and play with her toys. She also loves food, probably the reason for her mischief. 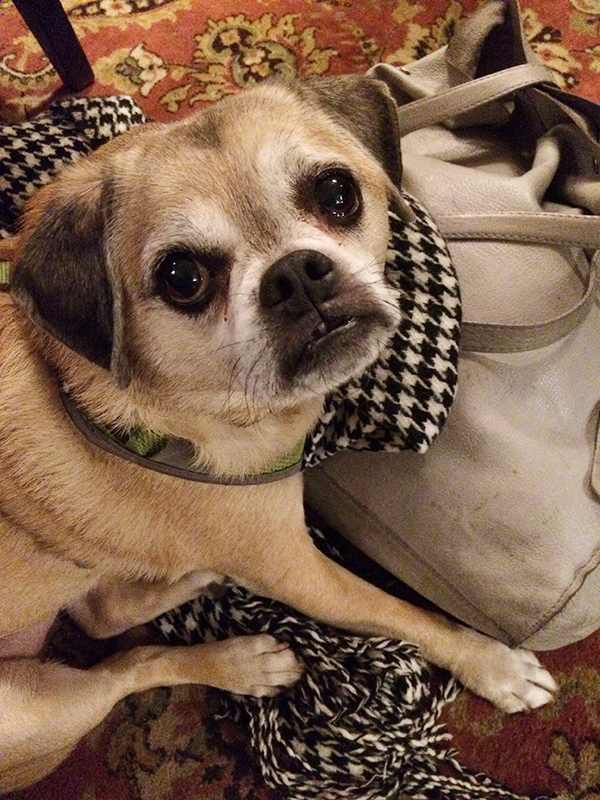 My partner and I have just adopted this amazing little fella: a 9-year-old Puggle called Sam. He had to leave his previous home because one of the kids had an allergy to dogs. As my friend Vicki said: “Sam has landed in clover with you two!”. He gets (and gives) a lot of love in his new home, and has created an instant family for us. He is the best. 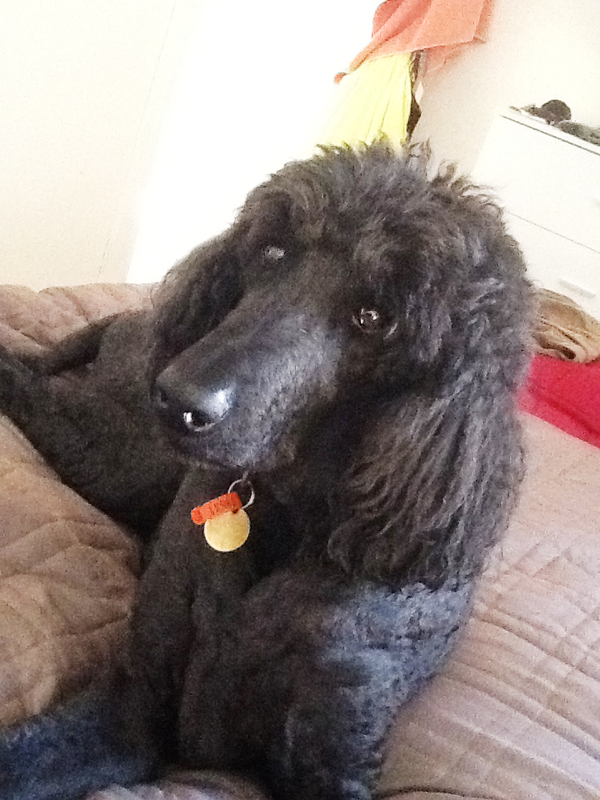 My Standard Poodle Bosco. Like Nici in The Troubadours books he was a guardian, a healer and a perfect gentleman. 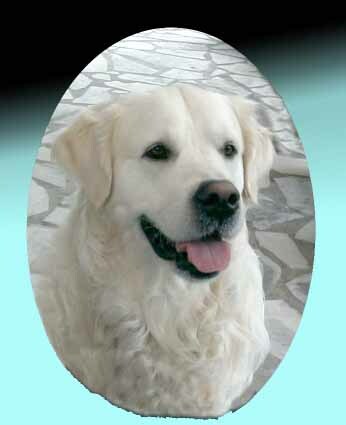 Ben was a golden retriever with Patou genes (completely white) and he was the best friend I have ever had the pleasure of sharing my life with (after terriers, poodles, labradors…). The first is a glamour photo of our yorkie named Charlie. The second photo is of our little toughie Dickens. The boys were yorkies who brightened our days. We lost both boys a few years ago, it broke our hearts when we lost our little shadows. 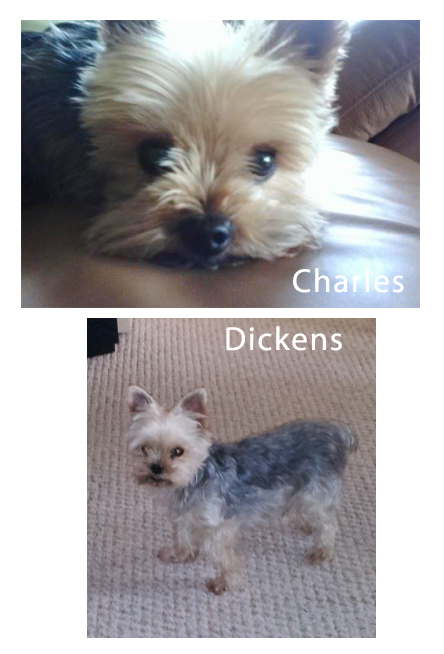 Yes, we named the boys after the author Charles Dickens. My name is Clowie. 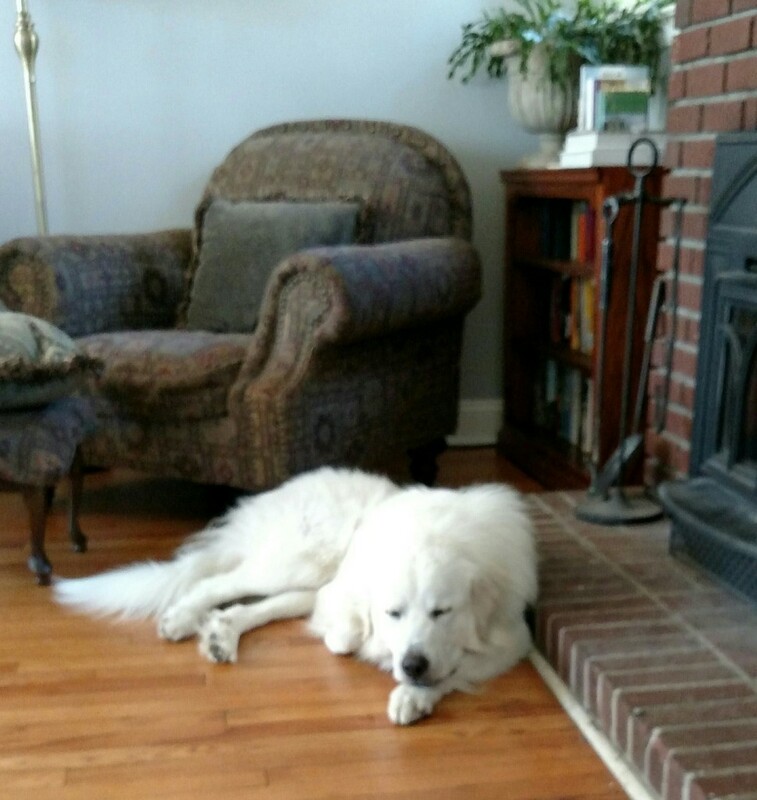 I am a Pyrenean Mountain Dog, or Great Pyrenees. I was born in England then moved to the Spanish Pyrenees for a few years before returning to England. I look after my bipeds and our two cats. I enjoy taking my bipeds for long walks and I love meeting people. As socialisation is so important for dogs I have taken mine to the next logical level and have my own social media accounts. I enjoy a good bark on Twitter and I also blog about my adventures here. The inspiration for LEO in “The Zebra Affaire” was Rupert. His owner was a school friend of mine who still lives in South Africa. Sadly Rupert died, and Marc posted this gorgeous picture on Facebook as a tribute. 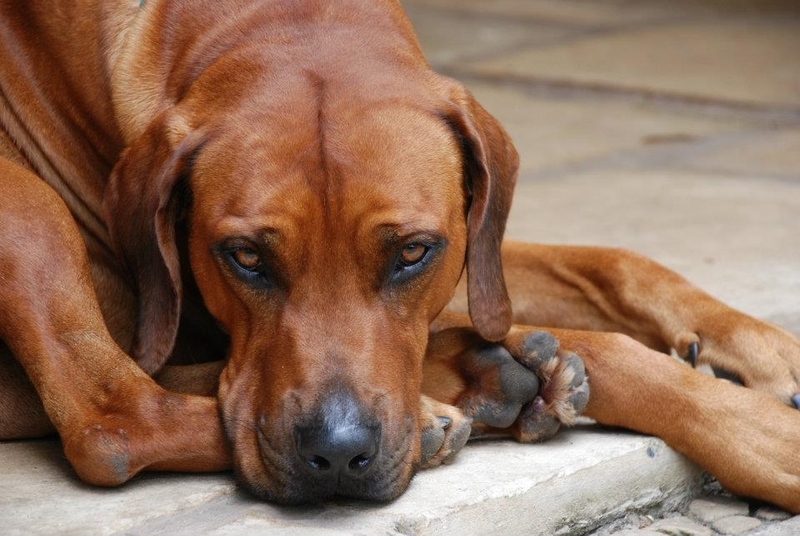 When I saw those wonderful dark canine eyes, so strong, intelligent and caring, I felt compelled to feature a Rhodesian ridgeback in my novel. 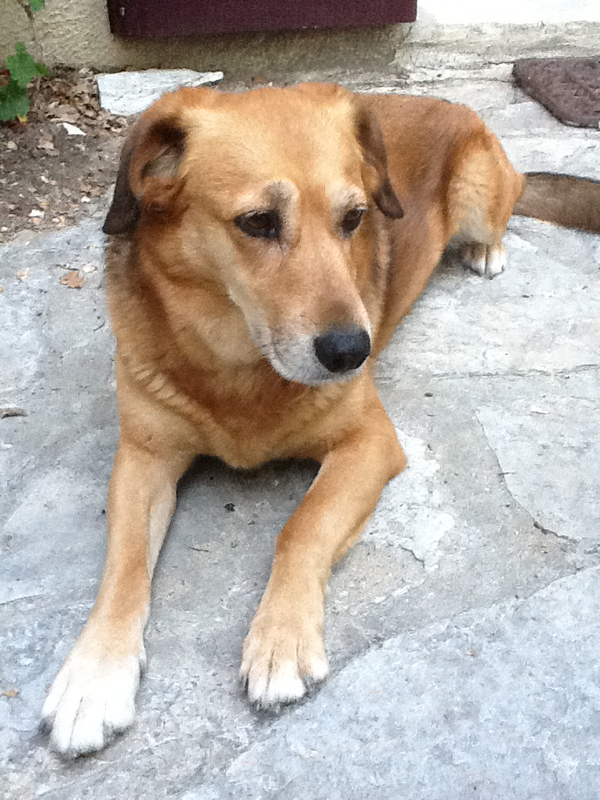 And what a delightful contribution Leo has made to my story… Funny how a dog can “humanize” a narrative. Here’s a picture of the late Rupert…a most magnificent creature! Wolfie, the star of your Photoshop homage is a rescue. The shelter claimed she’s a German Shepherd mix, but I’ve always felt she’s inclined toward Husky. She has the agility of a cat, walking across the top of fences and gates in a way no dog is supposed to. She is fiercely loyal to myself and my two sons, but remarkably egalitarian about it; literally pacing off the distances between the three of us about the house, and then resting with a sigh at the center point, equally equidistant to her loving boys. Though tough as suggested by her name “Wolfie”, she can genuinely be a feminine doll, as seen in this “Little Red Riding Hood” picture. 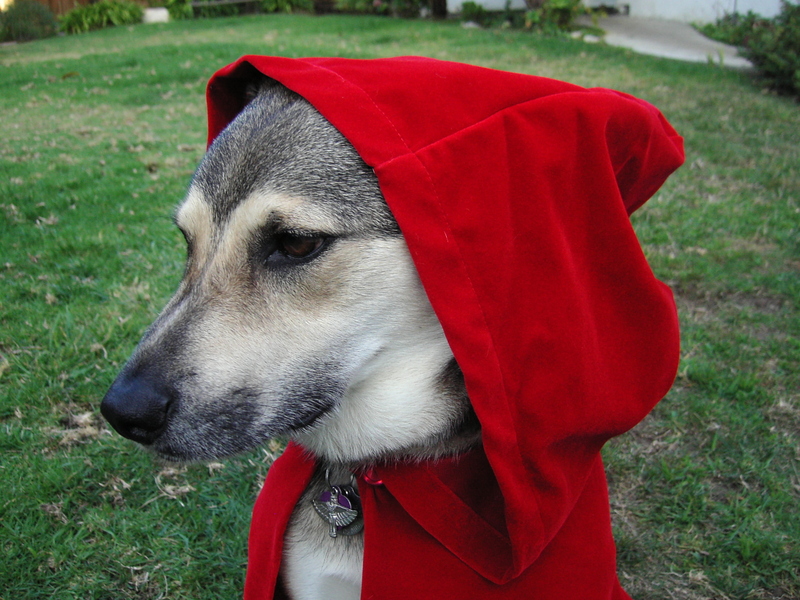 The genesis of the picture is obviously based on her name, the big bad wolf and the red hooded lass from the fairy tale. My name is Luca. I’m an Australian shepherd full of beans. 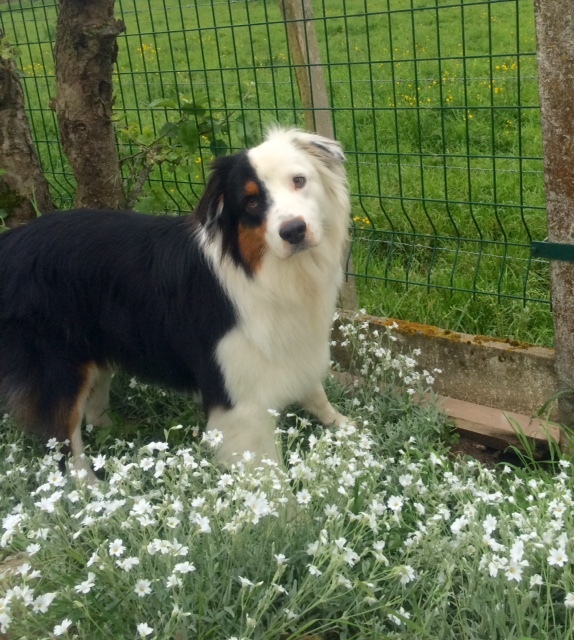 This is a photo of me when I first came to my humans who live in the south of France and Denmark. Behind me is Bloubelle who is much older than I am but we get along. I’m now as big as she is or a trifle bigger because my fur sticks out more. In summer I get blonder but in winter I’m a very handsome russet. My white socks are quite elegant, but often dirty because I go for every puddle, creek, stream, river and then I’m muddy. I’ve been to dog school and can do the basics, but I’m not very focused. When we’re in Denmark we meet lots of other dogs and I play like mad. When we go to kennels I play non-stop too. This gives Bloubelle a break as she’s not specially playful and prefers to snooze. I could chase sticks for hours. I make a point, however, of never bringing them back. My name is Bloubelle. I’m part Belgian shepherd and part hunting dog. I have a lovely made-up husky-like look about my eyes. I seem sadder than I really am because one of my tear glands doesn’t drain properly – so I have a sort of permanent drip of tears like a clown on one eye. I’m ten but I’m full of energy. Actually I’ve always liked my bed and these days can happily spend long hours in it. I was never trained to go to bed. Whenever we come home I usually am tired and head straight for bed. My humans live in the south of France and Denmark. In the former, I like to take off in the woods and find leftovers from hunters. In the latter, we meet lots of other dogs and have a different lifestyle. I have a healthy appetite except when I’m fed bones I don’t digest well or have stuffed myself with those leftovers… I’m essentially gentle and can handle children. Guests find me excellent company. I like to bark at dogs I don’t like or at humans I think aren’t invited. I guess that makes me a pretty good watchdog. 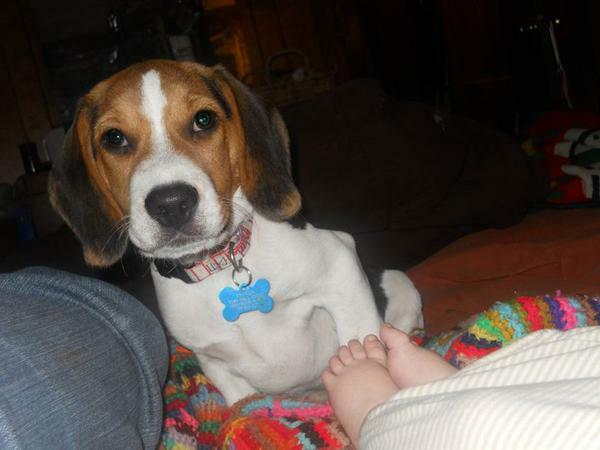 Charlie the Beagle is a family dog through and through. He spends his days herding cats and human siblings and sleeping at his human mom’s heels. He is two months younger than the youngest kid in the family and (shhhh!) has no idea he was *adopted. * Loves: Marosnack treats, going away in the car, snow up to his belly, and when Dad comes home. Hates: being left alone when dogs aren’t welcome. 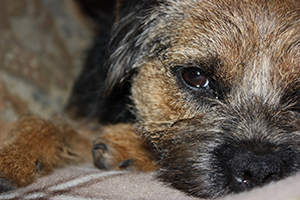 Jess, the fourth child in our family is a 6yr old Border Terrier. She was born on a farm in the Upper Coquet Valley, Northumberland – true Border Terrier country. She lives up to her terrier reputation, loves walks, regularly turns a deaf ear and can fettle a rat with a quick shake of her head. To us though, she’s just a little softie who likes nothing better than stretching out on the sofa. 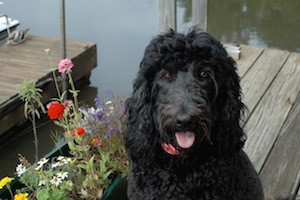 Chouette is our seven-year-old Labradoodle who was flown to us as a puppy from her breeder in Colorado. She was bred for temperament and it shows; she’s a very mellow young lady, merry and quite bright, who wants very much to please. She wins over all of our friends and anyone else who encounters her. She lives with us on our little farm in Southern New Jersey and loves helping out with the chores. However, she’d much rather run alongside the tractor than ride in it. 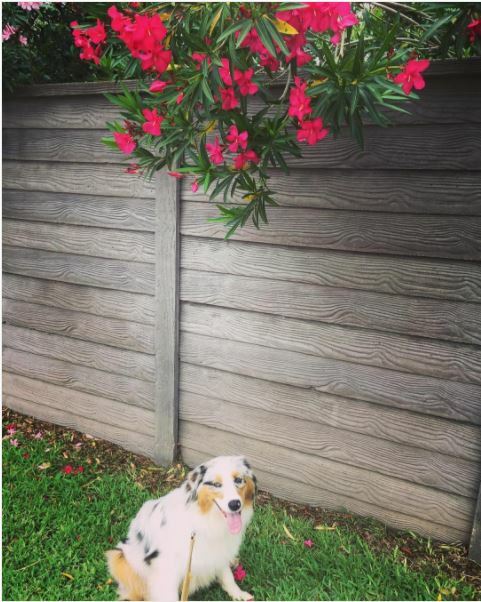 This is Buddy from Melbourne, Australia. Buddy is from the lost dogs home and was very skinny and shy when my mum and brother adopted him. Now he is a solid, happy hound with a heart of gold. 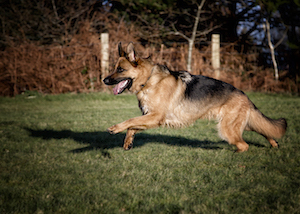 Tess, not quite two, is a typical German Shepherd. Big and bold and boisterous while at the same time sharp and nervy. She loves to meet new people and particularly likes children but I have to make sure she doesn’t bowl them over! She is easy to train and is a good trainer too – I am now in a daily routine of beach walking and my mother is trained to give her a treat after every (human) meal! She’s a very important part of my life and makes each day special. Before Bella Boo came into my life my daily routine was not particularly healthy. I work long hours and found myself going from work to bed on a regular basis. Having Boo has made me value my free time and I am very lucky to have a mother and a daughter who give her time when I can’t. 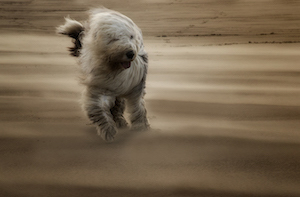 Although Old English Sheepdogs are supposed to be couch potatoes, Boo is very active. She’s big and boisterous but also chilled out so nothing much upsets her. She likes nothing better than rushing into the sea, rolling in the sand and, if I am not careful, depositing half the beach onto my bed! Before her first season she suffered a pyrometra and I nearly lost her. It made me realise how precious she is to me and how much value she adds to my life. 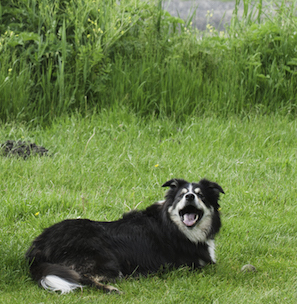 Barney, the Border Collie, prefers people to other dogs and has become the mascot of Llanelli Shadowlands, our group of photographers in Wales, UK. He goes on every photo-walk and when we take ‘teamies’ he’s the most popular poser. He’s an action dog, loves chasing a stick or a ball, loves the beaches, rivers and mountains we have round here, but at the end of a busy day he enjoys a cwch (Welsh for cuddle) on the sofa in front of the TV.